CR/CF Series heat detectors offer fixed temperature or combination rate-of-rise and fixed temperature detection. RATE-OF-RISE: A temperature increase at the sensor of 15F (9C) or more per minute activates the rate-of-rise feature. This closes the contacts in the sensor to transmit the alarm condition to the fire alarm control panel. When the rate-of-rise element alone has been activated, the sensor is self-restoring. FIXED TEMPERATURE: If the temperature of the center disk rises to the sensor's rated temperature, the fixed temperature element activates. This closes contacts in the sensor and transmits an alarm condition to the fire alarm control panel. The fixed temperature element is non-restorable and, when activated, the detector must be replaced. 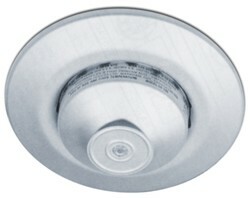 The need for replacement is indicated when the center disk has fallen free from the detector.